China China Perth | China China Perth – Chinese and Thai Takeaway with a funky new attitude. China China Takeaway & Chip Shop opened in December 2003. Since then, it has firmly established itself as Perth’s most popular Chinese eatery. At China China we strive to serve contemporary Oriental cuisine, with an emphasis on modern healthy living. Traditional dishes with Cantonese, Pekingese and Thai influences are tweaked with contemporary cooking methods. These concepts provide for a healthier, fresher and less fattening meal. 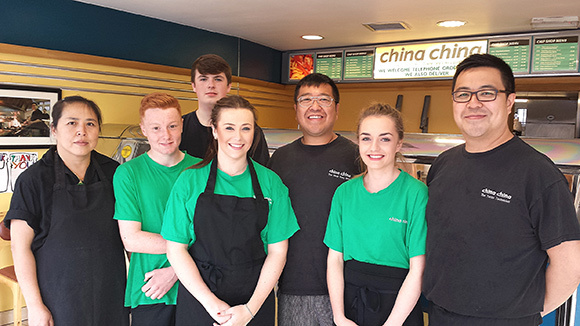 China China offers customers an enjoyable takeaway, without that overall sense of guilt! We are happy to be the only establishment in Perth, which will prepare gluten, msg, oil and salt free dishes upon request. We can also advise on ingredients such as nut traces etc…Please feel free to ask, whatever your query. Should you wish to stay at home to enjoy an alcoholic beverage and driving is not an option, or just tired after a hard day at the office. 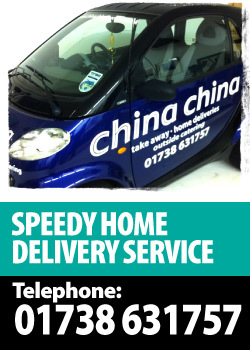 Our speedy home delivery service covers the whole of Perth, Scone and Bridge of Earn. So if it’s a guilt free, healthy Chinese meal you’re in the mood for. Let your fingers do the wok-king and give China China a call. Now, please feel free to browse our extensive menu. We look forward to feeding you.